The ECG-COMON was founded at the end of 2004 by a group of scientists who were looking for a way to push forward the application of the electrochemical noise technique to monitor localised corrosion. 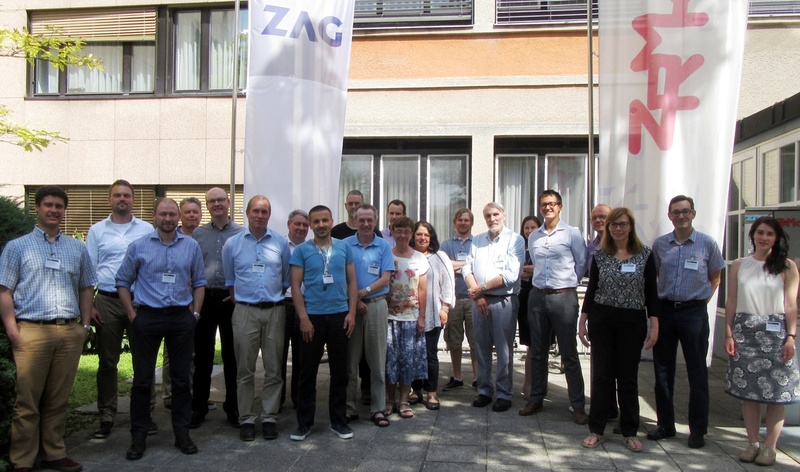 They met during a “brainstorming meeting” in Erlangen (Germany) and decided to create an informal group which meets once a year to discuss ongoing work and to organise Round-Robin excercises. Membership of the Group is open to those organisations that are currently performing and/or funding research and development efforts relevant to the Group’s objectives, or are directly involved in the application of the data generated by such work. Please find below the current member organisations and some further information on the Group. Membership to the ECG-COMON is by organisation, not by person. The current membership consists of 29 organisations from 15 countries (see below) some being active in the nuclear field and some in other areas. The Group is coordinated by the Executive Committee which is composed of the Chairman, Scientific Secretary/Vice-Chairman, the Past-Chairman and two Working Group Leaders. The Executive Committee is elected by the members of the Group. – Fight against uncontrolled proliferation of fissile materials. SCK•CEN also develops, gathers and spreads its knowledge through education and communication, and its available know-how and installations are also used for services to the nuclear industry, the medical sector and the government. production of radioisotopes for medical and industrial applications and for silicon doping for the electronics industry. – BR3, Belgian Reactor 3, was a prototype of the pressurised water reactors (PWR’s). It was selected as a European pilot project for the optimisation of decommissioning and decontamination techniques and processes and for the realistic assessment of costs. – VENUS, a zero-power critical facility that was intensively used for the validation of reactor core configurations and criticality codes. During 2008 and 2009, the VENUS facility was modified in the framework of the GUINEVERE project. New experiments aim to provide an answer to the questions of on-line reactivity monitoring, subcriticality determination and operational procedures in ADS. – HADES, the underground laboratory at a depth of 225 m, allows the study of clay as potential geological host formation for long-lived and highly active nuclear waste. – LHMA, the Laboratory for High and Medium Activity evaluates the effects of irradiation on materials at use in actual and future nuclear installations. A wide variety of mechanical, physico-chemical and microstructure research tools are available in and out of remotely-operated hot-cells. Additionally, the laboratories for Radiation Protection Dosimetry and Callibration and Low-level Radioactivity Measurements evaluate the internal contamination of employees and operators of the nuclear industry and the contamination of the territory,and the food chain. Furthermore, SCK•CEN has specialised laboratories for up-to-date research in Radiobiology, Microbiology and Radioecology (e.g., genomic platform, bioreactors, growth chambers and greenhouses). The laboratories for reactor dosimetry, for material testing and for radiochemistry support the research reactors and other labs and provide services to external partners and clients. CIEMAT is a public research body assigned to the Ministry of Economy and Competitiveness under the Secretariat of State for Research, Development and Innovation, focusing on energy and environment and the technologies related to them. It has offices in several different regions of Spain, and its activity is structured around projects which form a bridge between R&D&I and social interest goals. It collaborates with other R&D&I institutions, universities and business in the sector to transfer the knowledge and technology that it has generated, supporting and encouraging innovation and changing the economic model. CIEMAT took over from the old Junta de Energía Nuclear (JEN), which since 1951 had led research in nuclear fission energy production and control in Spain. In the decade of the eighties, it opened to new energy alternatives and to applied study of the environmental impact of energy. At present, the main lines of action are the study, development, promotion and optimisation of various sources as: renewable energies, nuclear fusion, nuclear fission and fossil fuels; the study of their impact on the environment, development of new technologies; not forgetting areas of basic research such as high-energy physics and molecular and cellular biology. Its R&D&I activity is framed in national and international settings, and is complemented by activities such as education, technology transfer, rendering technical services, advising to the administrations and representation of Spain in a diversity of international forums. Its mission is to contribute to sustainable development of the country and to the quality of life of its citizens through the generation and application of scientific and technological knowledge. Its goal is to maintain its position as a centre of excellence in energy, environment and technology and in basic research. Over the past 60 years Structural Materials Division of Technology Department has been deeply involved with the nuclear industry, and more specifically with the Spanish commercial plants, serving as support to various problems that have arisen over exploitation. From reactor vessel to steam generators passing through internal components, the group has participated actively in numerous projects related to the nuclear field, allowing to acquire a sufficient knowledge degree to successfully address this initiative. In particular the Structural Materials Division is strongly involved in the European Framework Programs since the 4 FP, having participate in different research projects such as CASTOC, TECLA, SPIRE, EUROTRANS-DEMETRA, LIRES, PERFECT, HELIMNET, PERFORM60, GETMAT, LONGLIFE, among others. Besides the already mentioned European projects, the group has participated in recent years in three projects sponsored by EPRI, UNESA and Spanish Nuclear Safety Council, relating to the determination of crack growth rates of alloys 600/82/182 and 690/52/152 in PWR reactor primary water environment. These projects have resulted in three documents belonging to the EPRI MRP program. Cormet manufactures material and corrosion testing instruments for the laboratory and field environment. We specialise in high-temperature high-pressure applications. Cormet delivers instruments to university and industrial laboratories including power-generation, chemical, transportation and oil & gas industries. Nearly all the products are tailored according to customers’ needs. – Mechanical and technical testing facilities and on site residual stress measurement equipment. The leading expertise areas of Framatome to be deployed in MEACTOS are therefore the planning, performance and evaluation of tailored laboratory tests under simulated plant conditions, in connection with the above mentioned highly sophisticated monitoring, and characterization techniques. IPS Elektroniklabor GmbH & Co. KG has been developing, building and supplying potentiostats/galvanostats for more than 20 years. In doing so, it draws on the decades of experience of Jaissle Elektronik GmbH, which began manufacturing semiconductor-based potentiostats back in 1961. In the year 1990 the first cooperations between Jaissle Elektronik GmbH and IPS Elektroniklabor began. Bit by bit a knowledge transfer took place and when during the late 2000er Mr. Jaissle rertired IPS Elektroniklabor took over the business activites of Jaissle Elektronik GmbH. The focus of the work is on the development and production of a variety of potentiostats/galvanostats, corrosion measuring cells, electrodes and accessories for various experiments and analyses on the subject of corrosion research. On the base of customer-specific requirements, we offer our customers tailor-made solutions for their respective needs. A wide variety of modifications of devices in the product range are also developed and implemented. This approach has proven its worth in the past and has led to long-term customer relationships. Our clients come from both R&D and commercial sectors. The Joint Research Centre (JRC) is the in-house science service of the European Commission carrying out research in order to provide independent scientific advice and support to EU policy. JRC research activities include a.o. the safety of present and advanced nuclear reactor systems including degradation of their components. JRC has a number of laboratories at its Petten site to investigate typical degradation phenomena of nuclear reactors. Among them are the AMALIA Lab for corrosion and stress corrosion cracking testing of current and future reactor materials in typical LWR conditions and high temperature – high pressure water environments and the Microstructural Analysis Lab (MAL) for microstructural analysis of materials. It will be these two laboratories, in which JRC will perform most of its research work for the MEACTOS project. JRC has wide experience on the degradation of reactor materials and collaborates with partners from the EU Member States and beyond and European and international organisations (NUGENIA, IAEA, GIF, EERA-JPNM, OECD-NEA, etc.) in its nuclear research activities. The Paul Scherrer Institut (PSI) is the largest research centre for natural and engineering sciences within Switzerland. We perform world-class research in three main subject areas: Matter and Materials; Energy and the Environment; and Human Health. By conducting fundamental and applied research, we work on long-term solutions for major challenges facing society, industry and science. PSI has a long tradition in energy research. With respect to nuclear energy, the Nuclear Energy and Safety Research Division (NES) has a unique position in Switzerland thanks to its heavy infrastructure, namely the Hot Laboratory with well-equipped hot cells and shielded zones for work and investigations on radioactive material. In addition, NES takes advantage of PSI’s large facilities, the Synchrotron Radiation Source (SLS) and the Spallation Neutron Source (SINQ). Based on this infrastructure and the know-how of its collaborators, NES is involved in three main topics of research: safety of currently operating LWRs, safety characteristics of future reactor concepts and related fuel cycles, and long-term safety of deep geological repositories for nuclear wastes of all kind. The work is being done on behalf of the federal government and in close cooperation with the Swiss waste management organization, Nagra, and the Swiss regulatory authority, ENSI. It also includes scientific services for the Swiss nuclear power plants. Most of the research is connected with international projects on a multi- or bi-national cooperation basis. Within NES, the Laboratory for Nuclear Materials (LNM) is the principal research unit and national centre of excellence in Switzerland in the domains of (radioactive) materials behaviour and ageing in nuclear installations. It provides material-related academic R&D contributions and scientific services to the sustainability of current and future nuclear installations for electricity and heat generation or waste reduction as well as to the performance of nuclear research facilities. A special emphasis is placed to the safety and safe long-term operation of the Swiss NPPs. LNM is engaged in academic teaching and education as well as in knowledge transfer in its activity fields contributing to the education of the future nuclear specialists and preservation of expertise and excellence. It operates a state-of-the-art laboratory and computing infrastructure and modelling tools for the characterization of (radioactive) materials and for the analysis & prediction of materials behaviour, integrity, safety and lifetime. ZAG is the leading research and testing institute of its kind in Slovenia. It is a state-owned, independent, impartial and non-profit organisation. The activities of ZAG are: (a) research and development in the field of materials and construction; (b) quality control of materials and construction and the calibration and verification of measures, standards and reference materials; (c) specialized activities, comprising expert studies, tests and investigations, measurements, inspections, monitoring and analyses of the condition of structures and transport devices, traffic structures, the natural and built environment, analyses concerning the efficient use of energy use and renewables, and analyses concerning the immovable and movable cultural heritage. During the period 2011-2016, ZAG has been involved in more than 55 projects funded by the EU (5 of them were coordinated by ZAG) as well as 38 national projects, funded by the National research agency and Slovenian ministries. Furthermore, during this period ZAG carried out two research programmes (Building Materials and Building Structures), where the total amount of financing equalled 4.3 full-time equivalent which over the years merged into one programme. ZAG Ljubljana has 178 employees, including 60 researchers with university qualifications and academic titles. ZAG comprises 14 laboratories and sections, equipped with advanced laboratory infrastructure which provides quality performance in individual fields of activity. ZAG became the leading institute by coupling of basic and applied knowledge and with its multidisciplinary approach which combines research and industrial research and development through many projects. It is well established in Slovenia and abroad. It is a member of many international forums, boards and associations among those also NUGENIA, ECG-COMON, CEN (European Committee for Standardization) and RILEM (International Union of Testing and Research Laboratories for Materials and Structures). energy in Romania. The history of the 45 years of activity recorded a series of successive transformations generated by the development of the national economy and by the adaptation of the nuclear field objectives to the new requirements of the society which led to changing the institute’s name. Starting 1st October 2013, the Institute for Nuclear Research Pitesti (ICN) becomes a subsidiary of the State Owned Company “Technologies for Nuclear Energy (RATEN)”, having the acronym RATEN ICN. RATEN ICN has as main activity objective the scientific research, the fundamental and applied technological development, the exploitation of its own research through technology transfer, design, investments, consultancy, expertise and technical specialized assistance, subordinated to ensuring the scientific and technical support for Romania’s nuclear energy sector. As main task, RATEN ICN is maintaining and developing the scientific and technological support for the national nuclear energy program, vital component in ensuring the sustainable, clean and safe energy for Romania’s citizens. Romania’s nuclear energy program foresees for the safe and competitive operation of Units 1 and 2 from Cernavoda, completion of Units 3 and 4, building a new nuclear power plant, promoting on the medium and long term of Generation IV advanced reactors, the safe storage of burned fuel and of radioactive waste. The R&D activities are based on a modern and complex infrastructure consisting of two TRIGA reactors (a steady state 14 MW and a pulsed one), post-irradiation laboratories, radioactive waste treatment and conditioning plant, nuclear fuel fabrication and testing laboratories, corrosion laboratories, thermo-mechanical and microstructural analyses laboratories, radiochemical laboratories, out-of-pile testing laboratory, etc. and specialists with deep experience in the nuclear field. Nuclear Materials and Corrosion Department is composed of several laboratories which are equipped with experimental devices and facilities for evaluating the structural integrity of metallic components under different conditions (various aqueous environments, high temperature and high pressure) relevant, especially, to CANDU reactor but also to boiling water reactors or pressurized water reactor. These activities involves the characterisation of important ageing mechanisms such as environmentally‐assisted cracking and thermal fatigue, and are of most relevance for the participation in the MEACTOS project. The Materials Performance Centre at the University of Manchester has a suite of 10 autoclaves that are used for materials performance testing in high temperature as BWR and PWR condition. Seven of them are fully refreshed to enable the accurate control of water chemistry (Li, B, and impurities) and dissolved gasses (hydrogen and oxygen). Every autoclave is setup for electrochemical and impedance measurements with external pressure balanced Ag/AgCl reference electrode that can operate in high purity water or an internal Pt/Pd pseudo reference electrode. The MPC has also two rigs for oxidation testing in high temperature hydrogenated steam at temperature in excess of 500°C. These facilities were developed in house and, thanks to the use of high precision digital flow meters and dosing pump, it is possible reproduce environmental conditions that are relevant to PWR primary water but at accelerated kinetics. In one rig it is possible to carry out testing of self loaded samples (e.g. C-rings, 3 or 4 point bent sample). The second rig is coupled with a 10kN Instron tensile machine and therefore it is possible to carry out test under dynamic loading conditions. As a collaborator/UK partner in the proposed program, the University of Manchester will be an integral part of this program through the utilization of two key facilities: the School of Materials Electron Microscopy Centre and the Dalton Cumbrian Irradiation Facility. The Electron Microscopy Centre includes several state-of-the-art analytical electron microscopes including an FEI aberration-corrected Titan “ChemiSTEM”, a new FEI Talos 4-quadrant SDD analytical electron microscope, and two new state-of-the-art FIBs, including a plasma FIB, and17 additional AEMs, FIBs, and SEMs. In addition to these electron microscopes and FIBs, Ditabis digital image plates are also available to high sensitivity electron diffraction analysis, which will be critical for this research program. The Dalton Cumbrian Facility is a new laboratory for proton and ion irradiation of materials, and has a high current TORVIS and low current SNICS sources for proton and ion irradiations. VTT is the biggest multi-technological applied research organisation in Northern Europe, and is a part of the Finnish innovation system under the domain of the Ministry of Employment and the Economy. VTT is a not-for-profit organisation that employs around 2700 people, out of which about 200 are active in nuclear energy R&D, and has an annual turnover of approx. 270 M€. VTT performs comprehensive contracted research in industry driven programmes on nuclear waste management, plant life management, operational and structural safety as well as on nuclear fuel performance. VTT is the major technical support organisation for the nuclear safety authority STUK as well as for the power companies. VTT participates and has participated in numerous European projects (e.g., SOTERIA, INCEFA+, PERFORM60, PERFECT, MULTIMETAL, SCWR-FQT etc.) on various aspects of nuclear power plant safety. In particular the Nuclear Reactor Materials team and its associate teams in the Nuclear Safety unit have a long track record in relating materials performance to microstructure, environmental conditions, aging effects and loading phenomena. VTT has been active in generating test data on EAC initiation in the national programme on reactor safety as well developing bellows loading testing equipment for initiation testing, fatigue testing, crack growth rate testing and J-R testing. VTT has performed investigations on materials behaviour in super critical environment both in national and EU-projects. A particular area of speciality for VTT is post-testing examinations by optical and electron microscopy, with the aim to better understand the role of microstructure evolution in a material’s cracking response in particular, and material deformation in general. Wood (formerly Amec Foster Wheeler) is a focused supplier of consultancy, engineering, operations and project management services to its customers in the world’s oil and gas, mining, clean energy, environment and infrastructure markets. With annual revenues of some £ 11+ billion, Wood designs, delivers and maintains strategic and complex assets and employs around 55,000 people in more than 60 countries worldwide. The corrosion expertise in the context of the MEACTOS proposal sits within the Materials Science and Structural Integrity unit based in Birchwood, UK. Wood (formerly AEA/Serco/Amec) has worked in the nuclear sector since the birth of the industry almost 60 years ago. With more than 3,000 nuclear specialists operating from main locations in the UK, Canada and the US, Wood partners with key customers such as EDF, the Nuclear Decommissioning Authority, Bruce Power, BAE Systems and Rolls-Royce. It offers the full range of nuclear services from site management through to waste management and decommissioning. Wood is providing architect engineer services to EDF for their UK new build programme, and supporting one of the largest and most challenging nuclear engineering projects at Bruce Power in Canada and providing site management as part of Nuclear Management Partners to Sellafield in the UK. Wood also provides technological and analytical services to its customers and their subcontractors through our world class radiochemistry laboratories. As a lead supplier of RTD services and a long-term contributor to European collaborative programmes in nuclear plant lifetime management under FP4, FP5, FP6, FP7 and Horizon 2020 Wood is well qualified to participate in MEACTOS. Furthermore, for many years, Wood (and its predecessor organisations, Amec FW, Amec, Serco, AEA Technology and UKAEA) have been active in generating EAC crack initiation and crack growth data in high-temperature water. Wood has extensive experience of EAC testing and has performed studies using complex-loading sequences. This work has been carried out in partnership with strategic customers, utilising industry leading research facilities and quality control systems thereby ensuring the reliability of all data in a range of different reactor environments. In addition, Wood is developing capabilities for nonisothermal testing for specimens in environments that would simulate conditions in BWRs, PWRs and advanced plants.